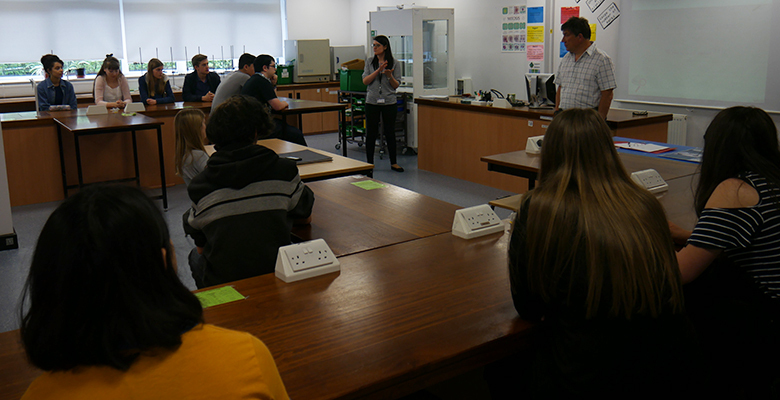 Students interested in Forensics at The Sixth Form College, Solihull learned what studying the subject at university is like this week, thanks to a visiting speaker from Coventry University. Dr Peter Hall is a Senior Lecturer on the Forensic and Investigative Studies degree course at Coventry University gave the talk to a group of first year students from the A level Biology and Psychology courses, as well as some students on the BTEC Applied Sciences course. The students got an insight into what studying Forensic and Investigative Studies involves and how it can help students develop skills to solve criminal and civil cases. The talk emphasised that this degree course focuses on investigative approaches, rather than the scientific laboratory-based analysis methods. With Year 12 students set to make their university choices and UCAS applications in the autumn term, when they progress into Year 13, this talk was useful to present a possible career path to this group of interested students.